Introducing our monthly newsletter. Keep up to date with the latest news from Bristol Technology Group including new services, cyber security, events, offers and important dates for your calendar. As your IT support partner, we believe that it is our responsibility to keep our customers up to date with the latest IT and security news, software and important events in the ever changing landscape of IT. This is especially true when it comes to cyber security which is at the forefront of all of our minds in this troubling time. We already maintain a cyber security news blog on our website and also post updates through social media. We are now extending this service to the more traditional method of email in order to help more of our customers. Who Will Receive the Newsletter? 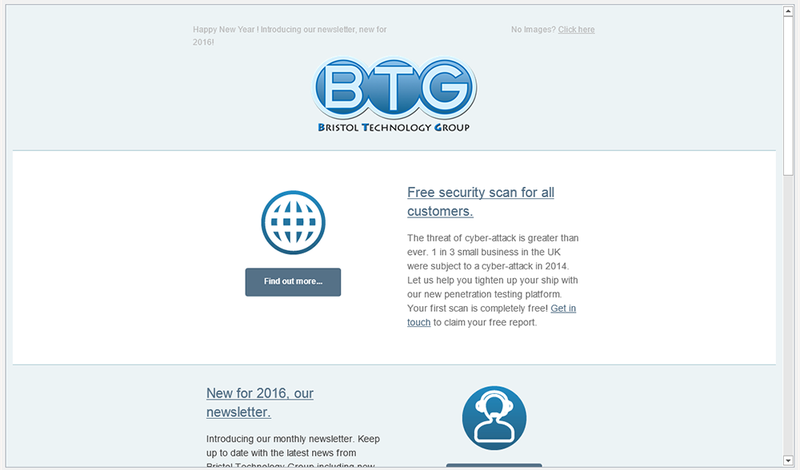 As a customer of Bristol Technology Group, you will automatically be subscribed to our newsletter. Should you wish to unsubsribe, follow the link at the bottom of the email and you will be removed from further issues. Non-customers watch this space, you will soon be able to subscribe via a link. Should you have any comments on the newsletter service or it’s content, don’t hesitate to get in touch. We always welcome feedback, we strive to continuously improve our services and your voice is important to us.